Each tale starts that way. And each tale tells a story. It could be funny or with a moral; shorter or longer. But we will always remember it. We, people, used to explore the world through stories. And tell about our experience and feelings through them. Some people are born with this skill; but for others it is a challenge. Of course, you could always present your idea with dull numbers and plain facts. But when you tell it as a story, you will find adherents much more easily. And will inspire them. So, this is the final step – to disseminate information about our giving and volunteering activities, and this way to motivate other people to join and follow suit. Or to find “their” cause. What are the stories and how to tell them in a fascinating way? What are the main features and elements of the story? How to visualize your story? What methods could you use? 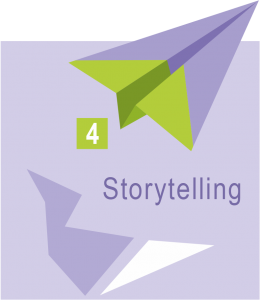 How to incorporate the story in your personal branding? How to use stories for better understanding of your corporate values and for building a stronger employer brand?